In need of some creative Independence Day pool party ideas that kids and adults are sure to enjoy? Look no further. Red, white and blue are the colors of the day. Change the lights in the pool to reflect the time of year and add those splashes of color throughout the backyard. The pool will always serve as the perfect backdrop. Great party favors are hand held American flags. This way everyone can wave their flag and take one home to remind them of the fun. If your party rolls into the night, you can have sparklers for the kids to use, but remember, to always supervise. The party loses its fun factor when someone gets hurt. To watch fireworks from your own backyard, find a local TV station that is broadcasting a 4th of July event. Projectors are easy to come by, so toss a white sheet against a flat area of your house or drop one over the patio opening and let the local broadcast appear on your makeshift screen. Put the floats to good use as comfy seating and hop in the pool to float around and enjoy your fireworks by the moonlight. Want an alternative to fireworks altogether? Our friends at Buzz Feed have some safe alternatives to fireworks here. The options really are endless. 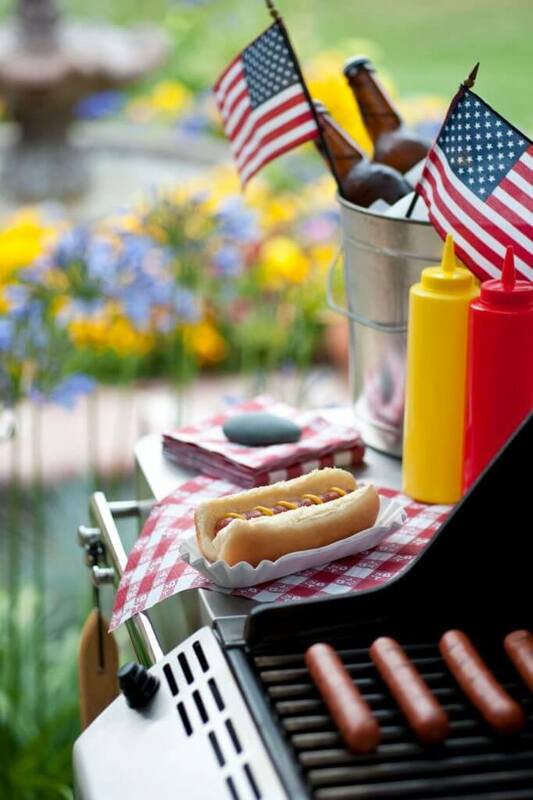 So think outside the box to host an Independence Day party that people are sure to talk about as the years go on.